The Real-Time Communications Conference and Expo brings together technical professionals and business executives from the data and telecommunications industry, standards bodies, policy and regulatory institutions, and academic educators and researchers to promote an open exchange of ideas to lead future development in the rapidly changing field of real-time communications. 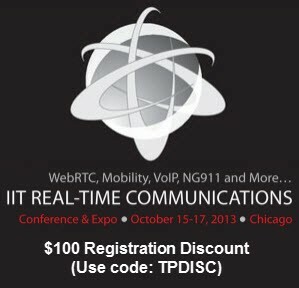 Use the Telepresence Options Dicount code for $100 off your online registration(see above banner). Brief Overview: Join us for the conference on October 15-17 in Chicago for a program that includes a dynamic group of speakers from Avaya, AT&T, Alcatel-Lucent, Microsoft, Oracle, T-Mobile, Federal Communications Commission (FCC), Columbia University, Mozilla, Nokia, Verizon, Cisco and others. The Real-Time Communications Conference and Expo is a globally recognized collaborative event, where industry and academia connect. Leveraging its unique academic setting, this annual conference brings together technical professionals and business executives from the data and telecommunications industry, standards bodies, policy and regulatory institutions, and academic educators and researchers to promote an open exchange of ideas to lead future development in the rapidly changing field of real-time communications. This year IPTComm is co-located with the Real-Time Communications Conference and will include presentations of theoretical and experimental achievements, innovative systems, prototyping efforts, case studies, and advancements in technology. The associated papers will be published in the ACM Digital Library. Where: The Conference is located at Illinois Institute of Technology’s Hermann Hall, 3241 South Federal, Chicago, IL 60616. Directions: Visit Directions to find your route to the campus by car or public transportation. Contact Us: For more information please contact one of the conference representatives at Contact.